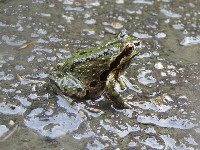 The SPLAT Project aims to prevent highway traffic from reducing populations of frogs and salamanders along Highway 4 on the west coast of Vancouver Island, B.C. Our blog is a way of sharing what we know (and don't know) about how to monitor and mitigate amphibian roadkill in our part of the world. We are keen to provide links to information from similar projects elsewhere. Local volunteers started the SPLAT project in 2000 after noticing squished remains ("splats") of many frogs and salamanders during rainy nights. After surveying the 40-km highway repeatedly, we identified the major concentration of "splats" within half a kilometer of a 4-ha wetland. Red-legged Frogs (Rana aurora), Pacific Treefrogs (Pseudacris regilla), Northwestern Salamanders (Ambystoma gracile) and Roughskin Newts (Taricha granulosa) breed in the wetland in late-winter and spring and then spend the rest of the year in the surrounding forests. Young of the year emerge from the wetlands in late summer. All ages risk becoming "splats" when they cross the highway to move between the breeding/rearing site and forest habitats. Researchers and volunteers with the SPLAT Project have been moving live amphibians across Highway 4 over the past five years. We catch frogs and salamanders in pitfall traps along temporary plastic fences in three different locations. We are now working with the B.C. Ministry of Transportation to design an experimental amphibian tunnel at the location where we consistently catch the highest number of amphibians. A road survey, literature review and on-going discussion are all part of designing an appropriate tunnel. Future posts will describe this work and the actual installation process as it unfolds. We have formalized ourselves into a non-profit society called The Association of Wetland Stewards for Clayoquot and Barkley Sounds. This project still falls under the title "SPLAT" which is affectionately known as the "Society for the Prevention of Little Amphibian Tragedies".